En Garde! True adventure awaits those willing to risk everything for fame, fortune, and honor. If you enjoy intrigue among the world's most powerful people, climactic battles with arch villains, and swooping in to save the day at the very last minute, then you, my friend, were born to be a swashbuckling hero! At Rapier's Point presents a whole new facet to your role playing campaign - that of daring escapes, duels , for honor, and swashbuckling fun. This book presents the era of Musketeers, chivalrous outlaws, and masked avengers who fight for justice, glory and the King. Players will find new professions unique to the genre, rules for fencing, muskets and pistols, and swashbuckling maneuvers. 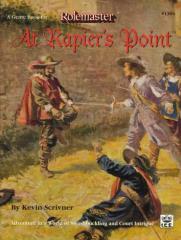 For Gamemasters, everything you need to know about 17th Century Europe to either base a historical game there, or to model a fantasy game around, can be found within At Rapier's Point. You'll also find sections on incorporating a swashbuckling setting into an existing fantasy campaign. • Five new professions including the Religious Dissident and the Scientist. • Rolemaster rules for black powder firearms and explosives. • More than twenty five historical and fictional NPCs. • Guidelines on the culture, history and people in the swashbuckling era. • Four full-length scenarios, five short scenarios, and sample character backgrounds. • Suggestions for incorporating swashbuckling adventure into fantasy, science fiction, Arabian nights, oriental, and other types of campaigns.